. 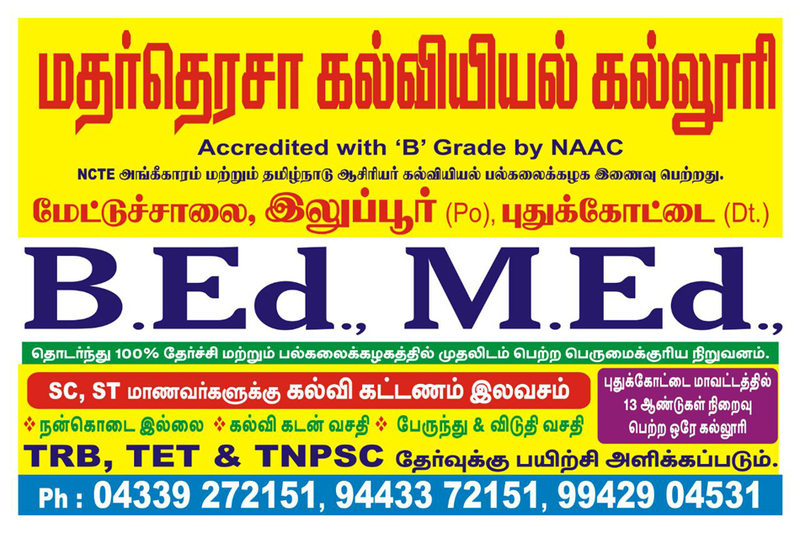 :: Welcome to Mother Teresa College of Education :: IQAC ::. The internal Quality Assurance cell was formed on 10th June2009. Every year IQAC meets at the beginning of the academic year, discuss and sets the action plan for the ensuing year. It functions effectively under the chairmanship of the principal. Three senior members and one external expert constitute the members of IQAC. To equip the library with adequate books at the cost of Rs. 50,000/-. To subscribe for additional 5 journals for the library. To purchase an LCD Projector and computers for the educational technology lab. Enhancing the competence of the staff by arranging seminars and workshops. One State Level Seminar during the academic year 2009-10. To equip the college with a botanical and herbal garden and to make the campus green and clean. To equip the library with adequate books at the cost of Rs. 75,000/- so as to meet the needs of the P.G programme. To subscribe for additional 8 journals for the library. To purchase an OHP and Slide Projector and a computer for the educational technology lab. Enabling the non-teaching staff to attend training/ courses for their professional development. One National Level Seminar during the academic year 2010-11. One seminar/workshop for the school teachers. One Workshop for the Teaching Faculty on Research Methodology. To offer a short-term course in Spoken English. This course will equip the students with necessary skills to sit for competitive examinations, face interview confidently and join job-oriented higher courses / programmes. Starting of M.Phil. Course from the ensuing academic year. Enabling the non-teaching staff to attend computer training/ Spoken English course for their professional development. Refresher course for the faculty on "Statistical Techniques". One International Level Seminar on Enhancement of Experimental Bent among Learners during the academic year 2011-12. One seminar/workshop for the school teachers on coping with stress. One day workshop on Classroom Management for high school teachers. To offer a short-term course in Spoken English to B.Ed. students. This course will equip the students with necessary skills to sit for competitive examinations, face interviews confidently and join job-oriented higher courses / programmes. To equip the library with Xerox machine. To undertake minor research projects. To strive to bring autonomy in our college.